FAS50 is the first submarine built by NovaTech. It was created for costal defenses. Although submarine was reviewed by several navies only four boats were built. Two for Uruguay navy and two for Nigerian navy. Unlike its predcessor the FAS50, FAS65 is far more capable submarine. It is in range with modern submarines of same class like Type 212-214 and others.FAS65 is also designed to easier land on the seas bottom. One unique design is that its main sensor-sonar is not located on nose as with most subs is, it is located benith the bow, allowing it full 360 coverage. Several navies that were replacing or enlarging its submarine fleets were interested in this class due its capabilities and price. Price is probably the thing that move countries to order it, because one sub cost 300mil$. 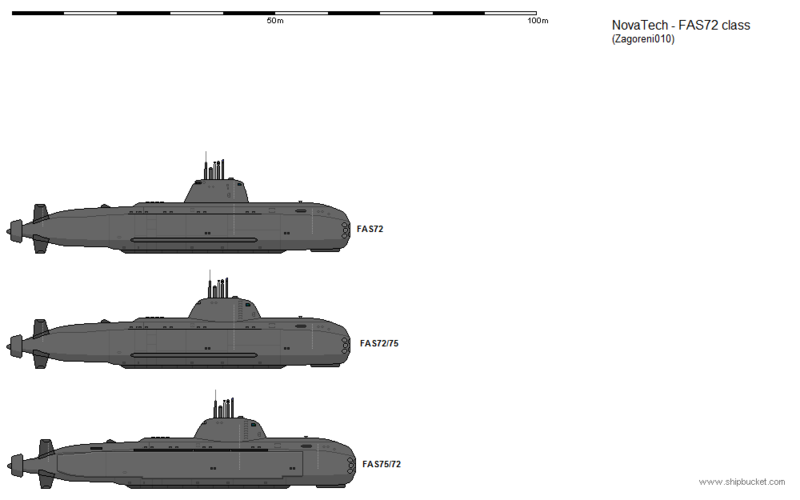 VN order two FAS65 to increase its submarine fleet from two to four. MN manage to improve its military budget and starting to finally modernize its navy. With exception of several new surface ships, Meixcan government decide to buy six smaller (50-70m) submarine in order to increase safety of its borders and also to easier hunt drug dealers. SAN order two new submarines to increase its submarine fleet, two additional FAS65 were on order. In 2016 Turkey become the last country to order FAS65 before the class is discontinued from market in favour of FAS72. Turkey order six FAS65 that would replace the six oldest Type 209 submarine on top of this two additional FAS90 submarines were ordered. Five of six FAS65 were to be built on Turkish shipyards and some of equipment on board is Turkish in origin, first submarine as well the two FAS90 were to be built by NovaTech German division(yard). This isn't the only purchase of new submarines as Turkey also buyed two German Type 214s between 2015-2017. In total 16 FAS65 were ordered and built before this type is discontinued. FAS72 is first of its series of three boats the standard FAS72, enhanced 72/75 and slightly enlarged vairant of 72/75 the 75/72. First or the standard variant is basicly enlarged FAS65 although the hull is changed a bit inluding the bow section. The radar-sonar dome is slightly larger and is still located benith the bow allowing more space for torpedoes. Con tower remain the same slightly enlarged. FAS72 have eight vertical missile launchers behind the con tower in two rows (three in each), each of this launchers can launch two AA-SideSwinger anti-air missile or single AS Styx anti-ship missile. Launchers have so called the roll bar, each bar can hold two of the smaller AA missiles or single larger anti-ship missile and it is equiped additional set of missiles benith it which automaticly reload once the ones in launchers were fired. It is usually set four of the launchers to hold AA missiles and four anti-ship missiles, crew can manually replace missiles if need. FAS72 max deepth is the same as taht of FAS65 while only speed is slightly improved. FAS72/75 is improved variant of FAS72. It came with new con tower which is similar to that of German Type 214. Its larger then the tower on FAS72. With exception of this everything else remains the same. The new con tower have more storage room for vital equipment, including AA radar and 3d imager that connects sensors on the hull. FAS75/72 is slightly enlarged variant of 72/75. It carries mostly the same equipment and armament as the 72 and 72/75 however there is few improvements. First of course as it name says it is 75 meters long. Max deepth is increased from 250 to 362 meters (although hull now can survive up to 390 meters), thanks to enhanced triple hull which is of the same thinkcness as standard dual hull on German submarines. Its radar-sonar system is also improved although this can also be installed on any other sub of this series. The new system have additional high preasured sensors that can create so call 2D-3D picture around the sub allowing the crew to see better what is around them. Like with rest of FAS65 and FAS72 subs it is highly automatized which means it doesnt need larger crew as small crew can do exactly the same job of the larger one. And also 75/72 have even more quit engines which with all ready quit engines makes her almost invinsible. Singapore navy order four FAS72 submarines as replacement for the older Challenger class submarines in service, later three additional FAS75/72 were ordered as replacement for Archer class. Thailand navy orders two FAS72 submarines, to inscrease its naval capabilities due Chinese expansion in South Chinese sea. Turkish navy was also in talks about ordering several of the FAS72 series submarines to booster its submarine fleet and replace six oldest 209/1200 (Atilay class) with six FAS72 and two FAS90 submarines. In total from 2011 to 2020 there was 22 FAS72 series ordered, from those 13 are in service, 6 were under construction and two were planned. Newly designed submarine Adamantium preasured hull (dual) which allows submarine to dive up to 770 meters deepth. FAS90 or as originally nicknamed FAS90 Ocean Dragon was originally suppose to be presented at same time with FAS72 series, however due technical problems still needed to solve, class was postponed. In 2019 NovaTech finally presented it. At the time of presentation FAS90 Ocean Dragon was the most advanced attack submarine in the world and most dangerous one. Submarine was heavily armed for itse size with ten foward(bow) torpedo tubes and four aft torpedo tubes, eight VLS for AA(anti-air) and AS (anti-ship) missiles and four VLS for cruise missiles. NovaTech completley redesign the diesel-electric engines and fuel cells that predcessor FAS submarines used, improving the new engines by 25%. On top of that a newly designed Hydrodynamic engine was also presented, engine that become popular in movie "The Hunt for Red October" but in reality, it was to costly to design and many nations including US,Russia and others use more conventional engines with improved hull skin for detection. Although both US and Russia work on this engine, it was never really tested. NovaTech take a massive risk and invest huge amount of money and resouces in developing it. Although originally created for larger (120-150m) submarine FAS90 was perfect candidate for testing. NovaTech own FAS90 submarine pass all expectations with this new revolutionary engine, that makes submarine (in conjuction with advanced anti-sonar skin) invinsible, however for a period of a ten hours when the drive need to recharge itself. This was created intentionally. Nevertheless even with this new engine was far more superior then any other, it spend less fuel as it using sea water or any other type of fuel, and then directing it by magnetic field. Many others who test this engines find it highly impracical and costly, this is the main reason why others stop their reaserch. But NT risk makes profit, the engines work perfectly but it also rise the cost of submarine for thirty percent. Its hull was also different in many ways from way how is built to material. The hull is created from several different materials fused together into one new armored hull called Adamantium. Nt believed that new armored pressured hull is needed for military submarines to achive bigger deepths then before. There is no informations about the hull itself however what is known is that entire submarine was created from three parts. front and aft hull fused together and the con tower this construction technic makes submarine faster to built and costing less for manufacturer. FAS90 has state of art sensors all around the hull and conning tower, 3D imagers that were introduced in previous subs, advanced propeller heavily shielded which decrease already low noise of the propeller. Cameras, located on several locations on the sub in small highly preasured bubbles that allows crew to see outside. New generation of sonar and sensors. Interesting part is that FAS90 have improved reloading system. It have fast autoloader for its torpedoes and each FAS90 can carry up to Twenty eight torpedoes, which allows two full salvos for both foward and aft torpedo tubes. It can carry twenty four AA-AS missiles with twelve always located in VLS's and eight cruise missiles. If necessary it can carry twenty mines tops. It also have small towing torpedo that can be launch from special tube. And small UAV that can be assembled by crew and launch once sub is on surface. FAS90 have advanced acoustic countermeasures, and ECM, which can either trick the incoming torpedo or disabling anti-submarine missile. Many were sceptical when this submarine was introduced, believing that this sub have to many advanced technologies packed in small hull, however 90m is not small, it is comparing to ballistic submarines that range from 120-180m but FAS90 is not created to be massive like those subs, it was crated to kill those submarines as well other attack submarines. It was created to operate in blue waters as well shallow-costal waters. It small crew of 25-30 can operate benith the waves for 90 days (if fully supplied). FAS90 Ocean Dragon was the last from FAS series (although originally FAS95 and FAS100 were also been planned) and NovaTech wanted to go out in the style. Reason why stopping with FAS development was that NT also design larger 100-150m subs and also design patrol boats, OPVs and crovettes and frigates. And it is belief that existing submarines like FAS65(although it is currently removed from market, however if some country still wants this type it could be constructed), FAS72 series which is the main ace for NT and the higly advanced and expensive FAS90. Turkey - Orders two boats in 2019, shortly after FAS90. However first sub was to be delivered five years later in early 2024, Turkey agreed with this, becuase it still needed few bugs to be fixed and NovaTech never release any new technology if is not near perfection. Knowing for NT products quality, it is not suprised that Turkey and other countries decide wait few years before first orders were delievered. Although if everything goes well, the first sub may even start with construction in 2021 and delivered and commissioned in 2022. Both submarines were without hydrodynamic engine. Vietnam - Was the first in 2021 to order single FAS90, which was to be delievered in 2024. Italy: Although it was believed that Italy will order additional Type 212 submarines, Italian navy decided to buy four FAS90 submarines, one with hydrodynamic engine. Australia: Australia ordered six Soryu class submarines from Japan in 2017, at least four of them were in service by 2022. In 2022 Australian government annouce that they make deal with NT in purchasing of two FAC90 submarines both with conventional engines. Taiwan - In 2022 shortly after Australia order of FAC90, Taiwan decide to buy one FAC90 without hydrodynamic engine. By the 2024 when first two subs were launched (Turkey), there were total of 10 FAC90 submarines ordered, with two of them in delivery and eight under construction, only one Italian was to be built with Hydrodynamic engine. United States and Russia try to buy the engine from the NT, but NT refuse. Several countries like Egypt, Sweden, Denmark and even Brazil were interested to buy FAC90. The Ocean Dragon while not numerious like its predcessors the FAC65 and 72 will still roar benith the seas.